The Centre for Research in Practice and Pedagogy (CRPP) is an extensive educational research centre based in National Institute of Education, Singapore. The major agenda of CRPP’s focus revolves around providing research that can be used as the basis for educational policy and decision-making. The goal is to develop a context for research that leads to innovative educational implementations in Singapore schools. Knowledge being the core object that constitutes both the processes and products of CRPP’s purposes, it was imperative that a knowledge management system enabled by latest technological advances be constructed to capture and distribute the research findings of the centre. To this effect, a knowledge web portal was designed and developed by a third party vendor with inputs from key personnel in CRPP. Knowledge is the most valuable asset to organizations and individuals alike. Organizations must efficiently and effectively create, locate, capture and share the organization’s knowledge and expertise to remain competitive (Zack, 1999). The idea of viewing organizational knowledge as a key strategic asset has been propagated by various management and organizational theorists (Brown & Duguid, 1991; Quin, Anderson & Finkelstein, 1996; Drucker, 1991). Commercial firms are implementing knowledge management processes and harnessing technologies to refine these processes (Rifkin, 1996). Many organizations are distributed with disparate and complex knowledge resources that need to be integrated into a dynamic, updated, and consistent systemic framework. The work of an research group is to develop and contribute to the local and international dialogues and this process needs to be dynamically managed and kept current. Data are the collected observations and facts; Data becomes information when it is placed within some meaningful context and knowledge is derived from information when it is meaningfully organized through contextual experiences, rationale questioning and communications or inference (Bruner, 1973; Matchlup, 1980; Dretske, 1981). Knowledge can be viewed as both a product to be stored and manipulated and a process of knowing and applying expertise (Blackler, 1995). Knowledge management refers to the set of systematic and disciplined actions that an organization can do to derive greatest value from the available knowledge (Davenport and Prusak, 1998). Knowledge includes both experience and understanding of people in the organization as well as information artefacts such as documents and reports available within and outside the organization. Effective knowledge management involves a judicious combination of organizational, social, managerial, and often technological initiatives (Marwick, 2001). Knowledge Management promotes an integrated approach to identifying, capturing, retrieving, sharing, and evaluating an enterprises information assets. These information assets may include databases, documents, policies, procedures, as well as the un-captured tacit expertise and experience stored in individual's heads. Technology can play a critical role in overcoming the debilitating barriers of time and space (Marwick, 2001). ¨ Management embraces a milieu of open discourse and dialogue. ¨ Current work practice and social interaction anticipates the receptivity of staff to new technologies. Design features and functions address their concerns and limit disruption in social processes. ¨ Active inclusion and participation of users in the design of groupware systems i.e. participatory design to heighten user trust and acceptance of the system. The portal serves as the digital repository showcasing CRPP’s current research work. It serves as the one-stop forum for the effective dissemination of information and research findings of CRPP. It is also a dynamic hub catering to the professional development of educators in that it fosters collaborative work through on-line discussion forums thus ensuring the translation of research findings into professional practice. Amaral and Rozenfeld (2001) explain the pertinent relevance of a model of users profile that acts as the scaffolding element in specifying the permission of different types of users and is connected to access control. This facilitates expertise location and tapping the underlying tacit knowledge banks of these experts. Along these lines, CRPP’s portal has several layers of access rights for different target audience. The public at large and CRPP’s staff are designated varying levels of access control according to their permission rights to protect the confidentiality of the knowledge work flow processes. The following are the codes for the levels of access that would be assigned appropriately. The lower the numerical strength of the code, the lower the level of access. Visitors and guests are be granted the lowest level of rights to anonymously access the contents in the public domain of the portal. Others will be assigned userids and passwords for log-in as well as appropriate access rights by the portal administrator for the relevant research projects they are involved in. Members of the general public who wish to sign up as CRPP community members sign-in online with their details and these requests are then be picked up by the administrator via the portal. Upon assessment of the merits of the requests, they will be processed and assigned CRPP community membership rights. The administrator has executive rights for the management of the portal such as being able to archive documents and projects, assigning user accounts, passwords and access rights and managing user roles via editing simple configuration scripts. The managers possess the rights to assign RAs and reviewers to the projects they oversee. They are also able to configure mailing lists to send out periodic emails to all members within their projects. RAs are able to use the portal to upload their documents into the portal for sharing, approval and reviewing. A folder for each research project would be created in the portal and knowledge management processes for the project would be executed within the structure of this folder thus ensuring the confidentiality and security of the documents being circulated within the project. Meta tags are notes in the head part of the html code on a web page that can provide certain document information to search engine spiders (http://www.madtraffic.co.uk/optimize/meta-tags.html). Metadata-based information enriches documents with semantic information by explicitly adding meta-data to the information sources (Staab & Maedche, 2001). All documents that are internally circulated within CRPP’s portal as well as those authorised for publishing purposes need to be meta-tagged for the purpose of indexing the documents within the repository and are then accessed through the portal’s search engine. Meta-tagging can be done by the authors i.e. RAs or by the project managers and/or project investigators by keying in information such as title, description and keywords for the documents they upload into the portal. Marwick (2001) explains that technology is most potent in the manipulation of explicit knowledge through finding it in the electronic databases online. The challenge is that the materials listed have to have relevant bearings for the tasks to be undertaken and tools such as text search; search based on meta-data of information can help to narrow the context of the search and make it relevant (Marwick, 2001). CRPP’s knowledge web portal contains an in-built search engine. The power of the search functions executed by this engine the portal is pegged to the level of security access rights assigned to the person logging into the web portal for the various projects. Individuals are not allowed to view documents that they are not entitled to for the particular project. Web crawlers from external web engines are only allowed to enter and track documents authorised for publishing in the public domain. Documents meant for internal circulation and publishing are blocked from the encroachment of these external web crawlers. Zack (1999) posits that knowledge needs to be presented in an integrated and dynamic manner that reflects the context of its use. Amaral and Rozenfeld (2001) emphasis the importance of embedding functions such as annotating, classifying and validating knowledge assets before they are mandated for publishing. In light of CRPP’s web portal, knowledge documents that have been reviewed and assessed to be appropriate for publishing can be accorded the following states to appropriate audience to view them. Tacit knowledge is what is ‘in the minds of the knower’ and is primarily derived from experience and embodies beliefs and values. It is of immense value since its mobilization and conversion is a crucial principle for new knowledge to be generated (Nonaka & Takeuchi, 1995). Conversion of tacit to explicit knowledge involves forming a shared mental model, the articulating through dialog (Nonaka, 1991). Collaboration systems such as on-line discussion databases and chats that facilitate formulation and sharing of metaphors and analogies facilitate capturing tacit knowledge. In discussion forums, features such as access control enable discussions to be restricted to team members and this has been proven to encourage frankness and engender feelings of trust amongst the members (Bradner, Kellogg & Erickson, 1999). Newsgroups and similar forums offer the same opportunities but differ in that they are open to all unlike the specific team discussions. Many people have been found to offer advice and guidance in newsgroups by a mixture of motivations such as altruism, recognition and acknowledgements though newsgroups face the potential threat of flaming, personal abuse and irrelevant postings (Marwick, 2001). The archive of the forum serves as a useful repository of knowledge and the number of questions a person has answered and the speed of response could be utilised as a means to index the person as an expert in the domain (Marwick, 2001). CRPP’s web portal has multiple discussion forums tailored to differing contexts of use. Safeguarding the confidentiality of knowledge contents residing in the knowledge portal is of prime concern and thus the online discussion forum has been designed to be a scalable system that dynamically alters its functionalities and extent of accessibility/usage according to the access rights of the individual logging into the portal. For the public who do not have login rights, a general forum is available to post and discuss issues of relevance and importance. For members with assigned rights of log-in into the portal, they are able to access project specific discussion forums. The discussion forums have database-driven search engines which limit the search to information hosted in the discussion forum only. The power of the search capability is pegged to the access rights of the individual participating in the forum e.g a member of the general public who has permission rights to view only information contained within general discussion forum is not able to access information found in the specific project-related discussion forums. 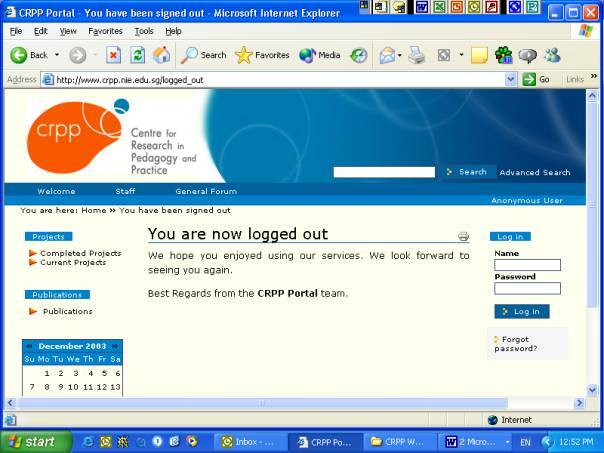 CRPP’s welcome home page would be of the design with interfaces as shown in figure 1. Upon clicking this icon, the reader will be ushered to the page containing the details of the staff at CRPP. There are two viewable modes to accessing this information i.e. listing by designation and by alphabetical order of names. Each name would itself be a self-contained link by itself which when clicked, will provide the biography blurb with digitised photograph of that particular staff member. This icon when clicked upon will pull down a drop-down menu listing all the research projects that have been completed thus far. Each project title would be a self-contained link which contains information such as a brief synopsis of the completed project, the principle investigators involved and the research findings published for general public’s viewing. Alternatively, for documents which can be made available for downloading only upon purchase, provisions for online purchasing of these documents will also be included. 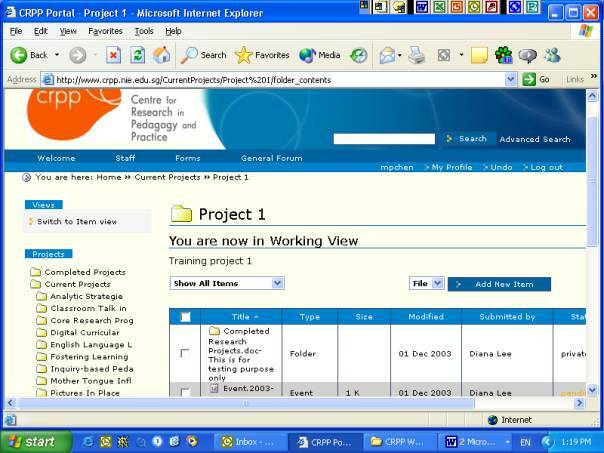 Similar to the ‘completed project’ icon, this icon when clicked automatically activates a drop-down menu enumerating a comprehensive list of on-going projects being undertaken by CRPP. Accessing the link for each project, brief information about the project could also be elicited together with documents published for public viewing. Listings of publications and journals produced by CRPP. There is a facility for anonymous users to submit their articles to these journals via the portal and upon being assigned CRPP community membership rights access the portal periodically to check the status of their articles. The general forum can be accessed by public-at-large including those with no login rights who can read the postings but in view of concerns over integrity of postings, only members with login access rights are able to post messages. The project managers and investigators are assigned manager’s rights to the project. 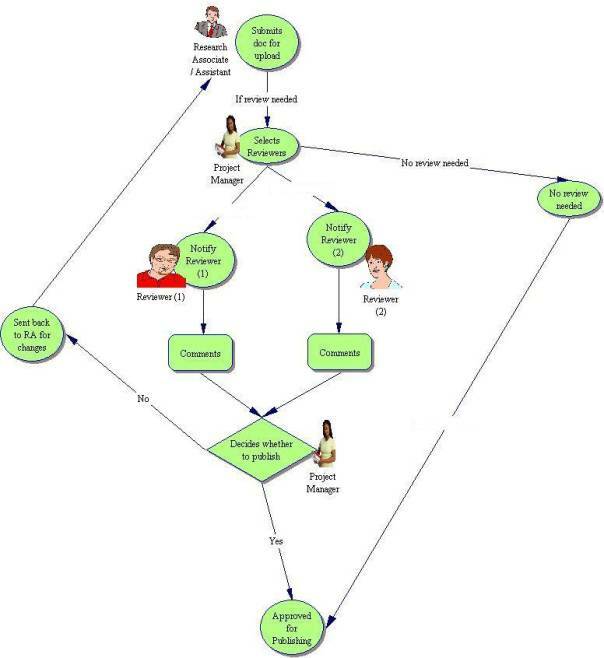 The manager’s working page for the project he/she is assigned to has a design layout as shown in figure 2. ¨ Normal mode. This mode is for viewing items in chronological order as would be seen by anonymous non-login users of the portal. It is also the interface for document file operations (e.g to upload a different file or change its title) and assigning of meta-data information for the document files. ¨ Working mode. This mode is designed for handling the internal document workflow processes such as reviewing and publishing. This icon allows the manager to alternate between the two modes of item view and working view. 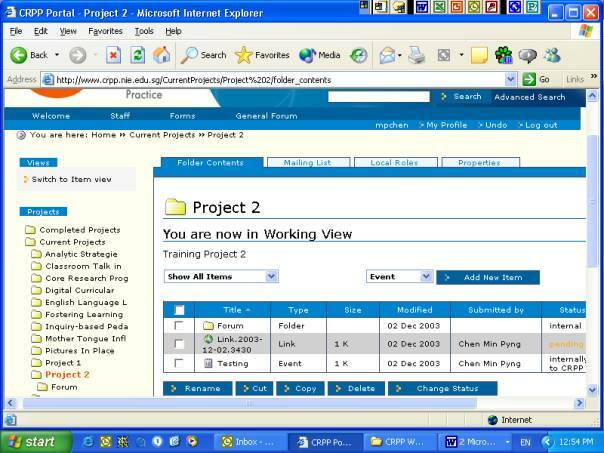 The item view is to view the pages with the content listing of the items situated within the project folder. The working view is to allow for the document workflow processes to be executed. This link is the one-stop gateway to all the forms that are made available to the staff of CRPP which they can download and use when necessary. This review box contains a listing of documents awaiting the action of the manager and each entry is a direct link to the document that can then be viewed and downloaded. Members can enter and update their personal information such as log-in passwords, names, email addresses, occupation, research interests and photo. These information is linked to the menu option of assigning local roles wherein there is the facility to search for members based upon their names, email addresses appended with their photographs. This icon when activated displays the secure contents of the project folder. Here in this repository the PM/PI can upload new files to the project folder as well as view documents meant for their attention, review and action. Documents can also be forwarded to the reviewers to gather their feedback. After receiving the comments of the reviewers, the document can then be published either within the project only, within CRPP only or to the whole world. This icon allows the manager to send out periodic email messages to the other members of the project team. The ‘local roles’ icon when clicked facilitates assigning roles such as RA, Manager and Reviewer. Names are searchable through the options of name, userid, or email address. Research assistants, associates, and reviewers are assigned RA rights to the project. The following graphic displays the contents of the RA’s working page. The RA has access rights to view, upload and send documents to relevant parties. He/she has to forward the documents that are to be reviewed to the managers who will then forward them to relevant reviewers. The reviewers are notified of this through email and upon log-in into the system they can download the documents meant for their review, annotate them and upload them back into the system to be sent back to the managers for further action. 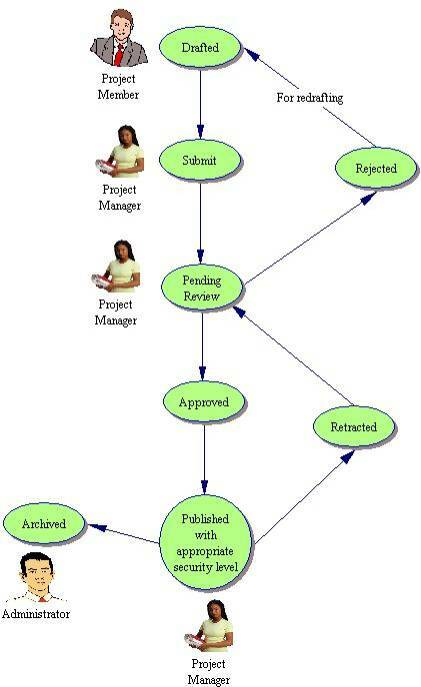 The following figure depicts graphically the document workflow framework for CRPP. The project manager and/or project investigator manages the reviewing processes and possesses ultimate rights in assigning levels of access to the documents and authorising them being published. This entire work flow process can be executed via the web portal with the aid of automated emails when necessary (e.g to serve as notification to reviewers to access the portal to access documents to be reviewed). Documents that have been approved for publishing can be published either internally within CRPP to be accessed by CRPP members with rights of RA and above or in the public domain to be viewed by one and all. Periodically on a monthly basis emails will be sent to those with rights of CRPP community membership and above to notify them of new entries in the portal since their last log-in. Thereupon by logging into the portal, the listing of these entries will be displayed in chronological order based on dates for viewing. The following diagram illustrates the document lifecycle. At any point of time, project managers can retract a document after it has been published for public viewing when updates or modifications need to be done on the document. These documents can be archived after their period of relevance and stored on archive CD-ROMs for back-up purposes. CRPP’s knowledge portal is a dynamic electronic space where its members can come together to interact and collaborate on a widespread scale of research knowledge related issues. Its an innovative digital repository where diverse knowledge workflows, processes and resources converge to present themselves in uniquely rich ways for the benefit of knowledge workers. It would both be a potent broadcasting face for the centre’s knowledge pregnant activities and findings as well as a professional development site for teachers as well as educational practioners. Amaral, D. C., & Rozenfeld, H. (2001). Explicit knowledge management on the product development process. Paper presented at the 3rd Congresso Brasileiro de Gestao de Desenvolvimento de Produto, Florianopolis. Applegate, L., Cash, J., & Mills, D. Q. (1988). Information Technology and Tomorrow's Manager. Harvard Business Review, (November-December), 66, 128-136. Blackler, F. (1995). Knowledge, knowledge work and organizations: An overview and interpretation. Organizational Studies, 16(6), 1021-1046. Bradner, E., Kellog, W. A., & Erickson, T. (1999). The adoption and use of 'babble': A field study of chat in the workplace. Paper presented at the Sixth European Conference on Computer Supported Cooperative Work, Copenhagen. Brown, J. S., & Duguid, P. (1991). Organizational learning and communities-of-practice: Toward a unified view of working, learning and innovation. Organizational Science, 2(1), 40-57. Bruner, J. S. (1973). Beyond the information given. New York: W.W. Norton & Company. Davenport, T. H., & Prusak, L. (1998). Working knowledge: How organizations manage what they know. Boston: Harvard Business School Press. Dretske, F. I. (1981). Knowledge and the flow of information. Cambridge: The MIT Press. Drucker, P. (1991). The new productivity challenge. Harvard Business Review, 69, 69-76. Marwick, A. D. (2001). Knowledge management technology. IBM Systems Journal, 40(4), 814-830. Matchlup, F. (1980). Knowledge: Its creation, distribution and economic significance (Vol. 1). Princeton, NJ: Princeton University Press. Nonaka, I. (1991). The knowledge creating company. Harvard Business Review, 69, 96-104. Nonaka, I., & Takeuchi, H. (1995). The knowledge-creating company. New York: Oxford University Press. Quinn, J. B., Anderson, P., & Finkelstein, S. (1996). Managing professional intellect: Making the most of the best. Harvard Business Review, 74(2), 71-82. Rifkin, G. (1996). Buckman labs is nothing but net. Fast Volume, 1(3), 118. Staab, S., & Maedche, A. (2001). Knowledge portals - Ontologies at work. Al magazine, 21. Zack, M. H. (1999). Managing Codified Knowledge. Sloan Management Review, 40(4), 45-88.